DYNAMIC FORCES® - DF SPECIAL - STAR WARS SATURDAY SUPER SET! 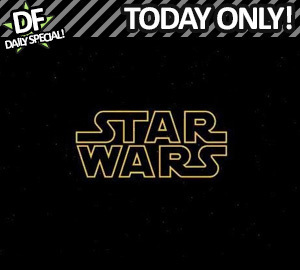 DF SPECIAL - STAR WARS SATURDAY SUPER SET! It's Saturday and Star Wars is always #1 in our hearts so we're all about Star Wars today and this weekend we're celebrating!!! We could not possibly be more excited!!! Today, we're offering an out of this world mix of STELLAR Star Wars COMICS!!! ULTRA-LIMITED signed editions!!! RARE variant covers!!! First you'll receive not one, but TWO randomly chosen signed Star Wars comics!!! One from the SILVER SIGNATURE SERIES and one from the GOLD ELITE EDITION SIGNATURE SERIES!!! And the fun doesn't stop there!!! Next, you'll receive FIVE randomly chosen rare and out of print Star Wars comics including limited edition variants, FOIL editions, and more!!! This is one Star Wars deal that can't be beat! Combined regular MSRP clocks in at $200 or higher, but this set is available today only for just $77.77! Get yours now before it's too late! * Please note: Multiple orders may receive duplicate books.